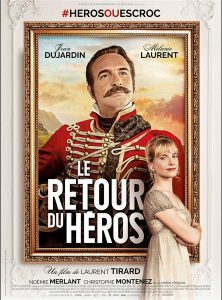 The Return of the Hero/Le Retour Du Héros is a period comedy set in the early 1800s France. It coerces some giggles but intentionally or unintentionally it is the fabulous costumes and sets that steal the spotlight. Captain Neuville, played by Jean Dujardin, is an aristocratic officer, high brow and an arrogant womaniser whose reputation is well known to Melanie Laurent‘s character, Elisabeth Beaugrand. Captain Neuville is an impeccable gentleman in the rose coloured glasses of the townsfolk and the other Beaugrand family members, especially Elizabeth’s smitten little sister Pauline, played by Noémie Merlant, who transitions between the innocent and nymph with wicked flawlessness when in his presence. Captain Neuville intends to marry into the wealthy Beaugrand family with the aforementioned Pauline, but fate steps in when the captain is recalled back to the army. His parting promise to write to Pauline ends up cementing Elizabeth’s notions about Captain Neuville when no letters arrive; it is a bittersweet victory when Pauline falls into a life threatening melancholy. In an effort to cure her sister, Elizabeth takes up Captain Neuville’s promise and writes to Pauline in his stead. Her fanciful adventures and tales extend well past the French army’s campaign end when it’s obvious he won’t be returning. Elizabeth finally gives him a heroic death to set Pauline free from Captain Neuville’s spectre to allow her sister a new life. Years later his unexpected return threatens to unravel all of Elizabeth’s machinations and her sister’s domestic bliss, worse still he’s happy to discard the rags he is in and wrap himself into the heroic cape she had created. Elizabeth becomes his unwitting accomplice and is forced to assist Captain Neuville to make the fantasy real or else be revealed as the true author of the fictional letters and stories. What follows is Captain Neuville and Elizabeth’s attempts to outwit each other with comedic escapades and schemes, he wanting to make quick riches while she attempts to get him out of her family’s life. Jean Dujardin injects a charm and charisma into Captain Neuville. The flash of this actor’s debonair smile subdues the questionable morals and the cowardice that is his character but there is a scarred vulnerability, a survivor of brutal Napoleonic age warfare that underlines his motive for running away and not stopping. Elizabeth Beaugrand is the captain’s opposite in all things, Melanie Laurent’s Elizabeth is fiery in her temperament when it comes to the captain, she is driven to bring about this man’s end and protect her family from his schemes. They both shine in their performances in their dysfunctional onscreen relationship, and both play off each other more like husband and wife than intellectual combatants that kept me invested. The French countryside, interior sets, and period costumes were stars of their own that fleshed out this world in its decadence and provinciality. There was one glaring logical flaw that took me out of the film; not one person seemed to question Captain Neuville’s fanciful exploits, even the members of the armed forces. I put it down to this being an era where there was no internet or fast communications to corroborate his stories or those stories told by Elizabeth. It isn’t a bad film and it is worth a viewing for its light-hearted tone, but it does tread upon well traversed tropes with very little surprises in the story.